Update: 11:50 a.m. March 15, 2014, with Comic Con Twitter announcement. 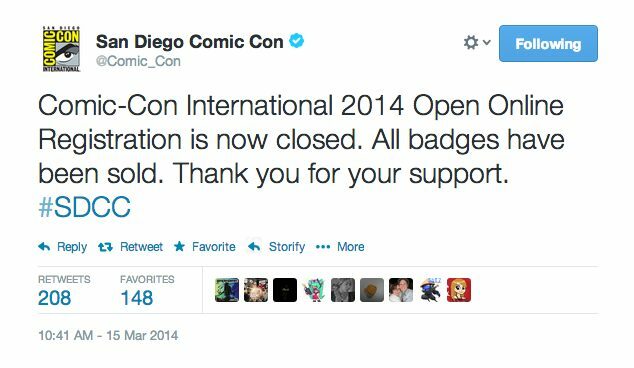 General admission badges for Comic-Con International in San Diego were sold out before 11 a.m. Saturday, shortly after online sales opened to the public. People who want to attend the annual pop culture confab July 23-27 at the San Diego Convention Center had to go online to acquire a member identification and registration code. They were then directed to an online waiting area between 7 a.m. and 9 a.m. Pacific Time Saturday. The online sales procedure has morphed over the years because of the huge popularity of the five-day event, which attracts up to 130,000 attendees. As expected, demand outstripped the supply of badges as the event usually sells out in one or two hours. Do NOT hit the web browser’s “refresh” or “back” buttons. Customers were urged to have all of their registration and credit card information at hand when their ticket purchasing session begins. Tickets are $35 for adults and $16 for juniors, military and seniors for the Wednesday Preview Night. Thursday, Friday and Saturday, the cost is $45 and $23 each day, respectively. On Sunday, prices are $30 and $15, respectively. According to Comic-Con, children 12 and under are free with a paying adult. Juniors are ages 13-17, and seniors are 60 and above. Individuals are allowed to purchase badges for up to three people, including themselves.